Dealing with jet lag is no fun, especially when you are older. We were exhausted after our first day and retired early. Awake again at midnight, I took a walk through neighborhood for about an hour, surfed the web for three more, and finally got back to sleep at about 4. It was daylight the entire time, just like in Alaska, and the city was surprisingly quite busy all through the night. George Oberg, a good friend, has joined us in Iceland. He will be traveling with us through December. George became a member of our travel club several years back when we went to New Zealand and Australia. He is a great guy (everyone loves George) and a wonderful traveling companion. Retired like us, he also has been bitten by the wanderlust bug. It'll be great to travel with him over the next five months! 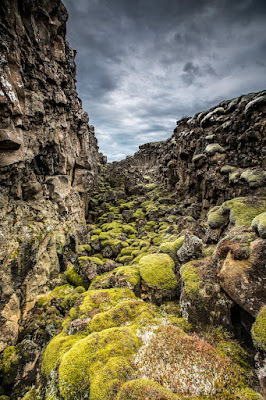 We have fourteen days in Iceland so we are taking it a bit slowly at first. For such a small country there is surprisingly a lot to see. The driving distances are manageable and the roads so far are good. We packed a lunch, saddled up, and headed east to Pingvellir National Park. Here we saw the rift valley formed by the convergence of the continental plates between North America and Europe. It was overcast and raining most of the day and that certainly addded another layer of mystery to the images of the area. The visitor center and lookout over the lake was packed with tourists and the views, the hike down into the rift and back up, as well as all of the wildflowers made for quite an adventure. This is also the site is the first parliament of Iceland, the small white building sits on a lava crusted flat at the edge of the huge volcanic lake. We left the viewing platform and opted to drive around the lake before heading on to the next spot. Along the way we happened up a little surprise, a hydroelectric plant built in 1937 using generators from the US that were destined for Europe. Because of the turmoil bubbling in Europe, they never made it to Europe and were utilized here. The site was not listed on any of the tourist maps or information we had and it was a wonderful surprise. We toured the plant and thoroughly enjoyed the modern, interactive techno-exhibits. The drive was wonderful, passing many small villages and farms, lots of sheep and horses, and another power plant, this time a thermal powered facility. The area was dotted with lots of small geysers and hot springs. There are fifteen different species of sheep, many with very large horns. These rams were resting on the lava flows overlooking the grassing Icelandic horses below. 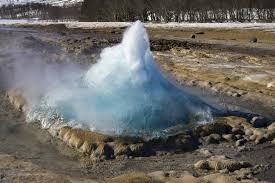 From there we drove to Geysir, a thermally active area of geysers and hot springs. While there we witnessed the spouting of the most famous of many geyers. It has only been three weeks since we were in Yellowstone National Park. Wow! This big guys blew once every four to six minutes. The wildflowers were in full bloom everywhere with carpets of lavender, blue, yellow and white. And again there were wonderful sculptures and land art at almost every stop. Our last stop was Gullfoss falls. This proved to be the major highlight of the tour. Driving over the lava crusted rolling hills and flat plains, we never expected to come upon this magnificent waterfall set deep inside of the rushing gorge. It was loud and its power reminded us of Iguazu in South America.